About HATS Productions which is an enterprise that tells the stories of amazing Australian people, to students in Middle Primary to Junior Secondary Year levels. The drama presentations are a blend of storytelling, role play, and incorporate student interaction as the story is narrated. HATS is an educational enterprise teaching children about inspirational people who have made a positive contribution to history and who have displayed personal qualities that make them worthy role models for today’s students. 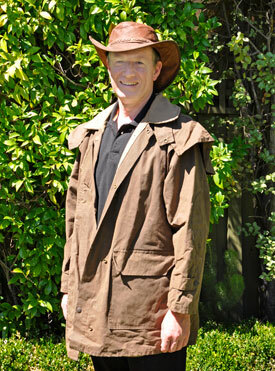 HATS Productions has been developed by John Arbuckle who is a Secondary Teacher with over 20 years' experience. Over the years, he has taught History to children from Year 5 to Year 12. Whichever the topic or the time period, he always enjoys teaching the stories of people. The learning of History without the soul of individuals can become dry and mechanical. History is the sum total of what individuals from the past have achieved and contributed to the world that we have inherited. It is individuals who contribute to the heritage of our nation, our time and our world. Most people's contributions will only be known by others within their own time. There are some people, however, whose contribution to heritage, and whose personal attributes are so significant, they must not be forgotten. It is the stories of these people that he most enjoys passing onto his students, and that he will present through Hats Productions.